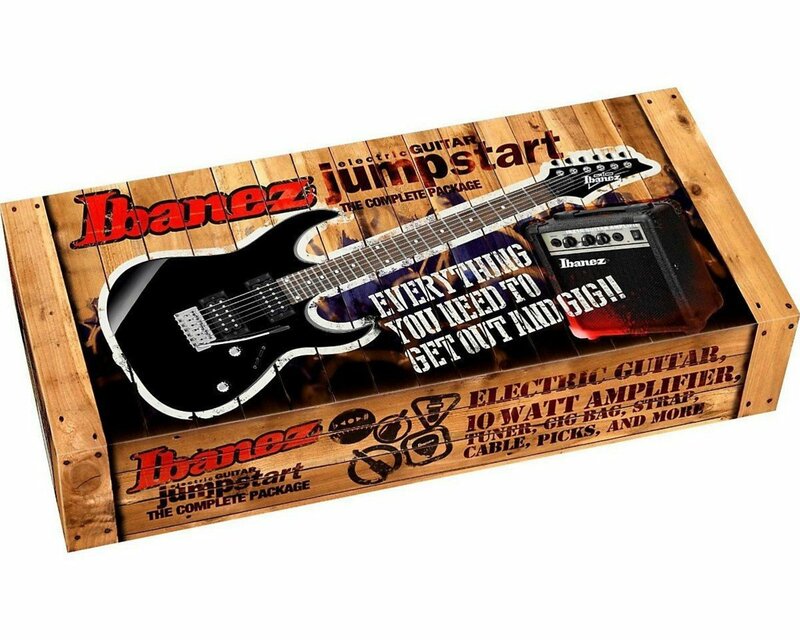 Guitar starter kits from quality brands like Ibanez give you everything you need to start playing, all in one package. Choosing a starter pack is a smart decision if you are thinking of learning to play the electric guitar. Beginners can grab their first guitar, amp and all the accessories they need in one handy, affordable package. Because these starter packs are made by big names like Epiphone, Squier by Fender and Ibanez, a newbie can start out with a quality setup from the beginning. It’s a cool concept, and the easiest way for a beginner to jump into the world of guitar. If you’re buying a first electric guitar for yourself or a child you want to give the newbie guitarist the best chance at success. But, you don’t want to blow too much cash on gear that could end up collecting dust. So, where do you draw the line between purchasing a quality first instrument and not killing your budget on something today’s wannabe guitarist might not care about in six months? Fortunately, the top guitar companies realize the dilemma you’re in and have put together these smart starter packs for reasonable prices. They generally consist of a guitar and amp, a strap, picks, cable and accessories and often an instruction book or DVD. In this review we’ll take a look at three of the best electric guitar starter packs for beginners. Fender guitars are among the best in the world, and the Fender Stratocaster has been played by countless rock, pop and country icons dating back to the ‘50s. Of course a new guitarist isn’t likely to start out with a Fender Strat. 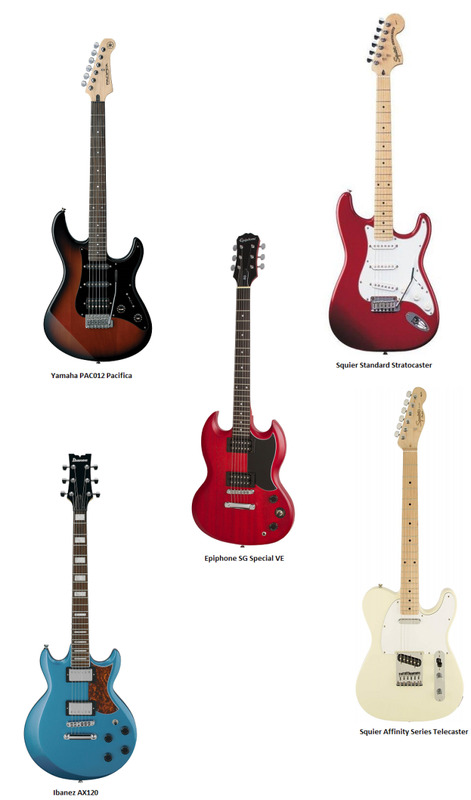 However, Squier is a company owned by Fender and licensed to make budget guitars to Fender’s specs. This means Squier also makes some of the best Stratocasters for beginners. You can start out with a no-name guitar from a big-box store if you really want to, but choosing a guitar with a respected brand on the headstock is a better idea. Plus, if the new guitarist decides the instrument isn’t for them, a guitar from a well-known manufacturer will have better resale value. In this starter pack you get a Squier Affinity Special Stratocaster, one of the top guitars a newbie can start out with. It has three single-coil pickups which will mean brighter, twangier sounds. 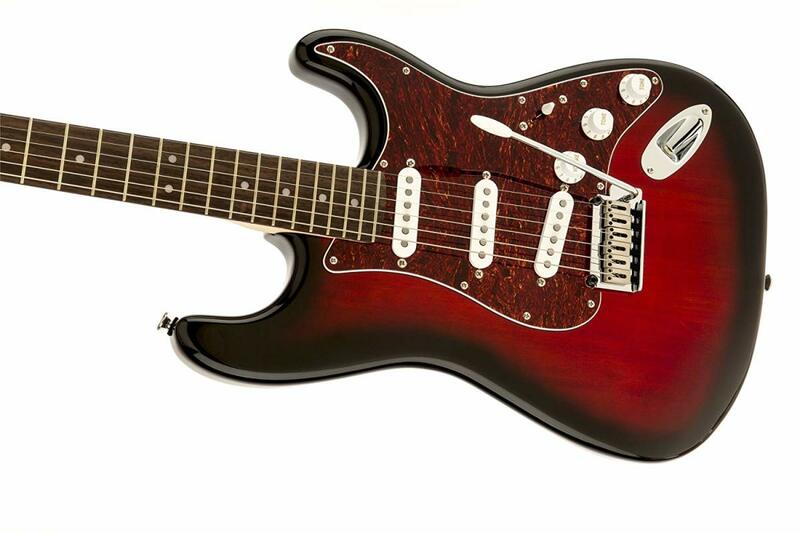 The Affinity Stratocaster is a great choice for beginners who are into blues, country and rock. However, the Strat has been used successfully is just about every genre. There really is no limit to what it can do. The Squier Affinity Special Strat has all the attributes of a real Stratocaster, because it is a real Stratocaster. 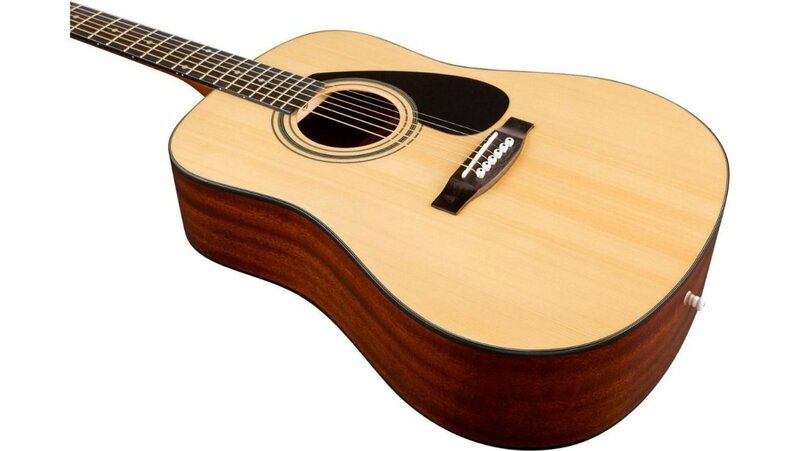 Starting out with a guitar like this is the perfect springboard to higher-end Fenders like the professionals play. But, just going by looks alone, it might be tough for some people to tell the difference. As cool as the Squier Strat is, it’s not the best thing about this pack. It’s only a matter of time before a new guitarist outgrows a first guitar. However, the amp that comes with the package is a Fender Frontman. This is plenty of amp to get a new player going, but more importantly it can serve as a solid practice amp even after a guitarist has moved on to a more powerful main amplifier. That means this package potentially has value for years to come. In addition to the guitar and amp you get headphones, a tuner, an instructional DVD, some picks, a strap and other good stuff to get a newbie going. It’s hard to find a better value than this offering from Fender. 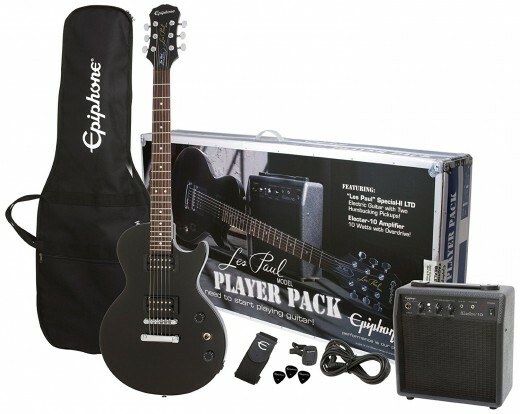 The Epiphone Les Paul Player Pack: All you need to start playing guitar today! You may not have heard of Epiphone, but you’ve probably heard of Gibson. Along with Fender, Gibson is in the upper echelon of American guitar manufacturers. They’re responsible for some of the most classic guitar models in history, including the Flying V, Explorer, SG and of course the famous Les Paul. Epiphone is owned by Gibson, and licensed to produce affordable guitars based on Gibson’s designs. This means any Epiphone product you buy has the Gibson name behind it, and you can expect quality. But Epiphone also stands on their own reputation. They make some of the top electric guitars for beginners and intermediate players, and starting out on an Epiphone guitar is a smart decision. The star of this starter pack is the Les Paul Special II LTD guitar. This instrument is a cut above what most newbies start out on, and, if cared for correctly, can meet their needs for a long time. While it doesn’t have the same carved top and thick body as a Gibson Les Paul, it does have a similar vibe. With two humbucking pickups the Les Paul Special will have a thicker sound than the Stratocaster above. This is true of humbuckers vs single coil pickups in general, but the choice of woods used also plays a factor in the differences between these two guitars. 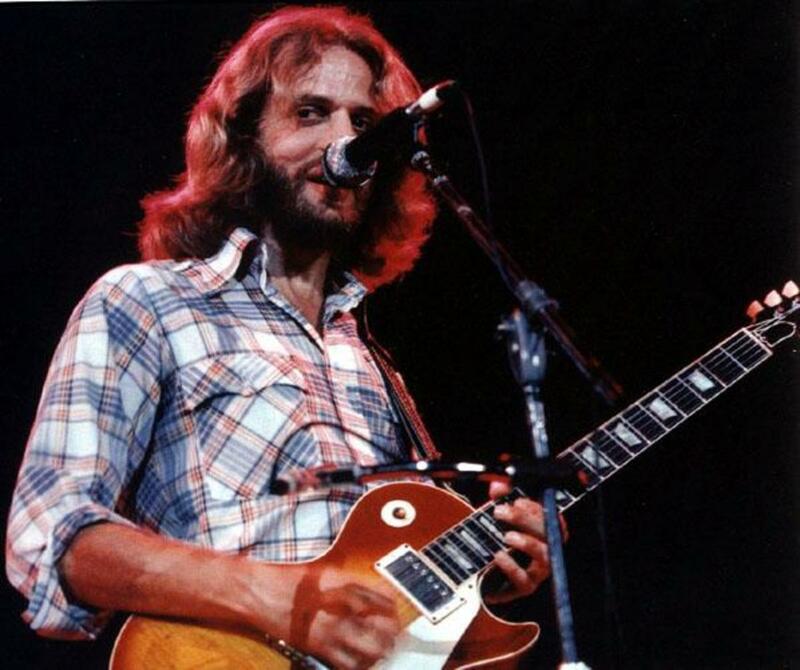 Les Pauls generally used deeper-sound woods, where Strats employ brighter-sounding woods. For newbies, it means this guitar may be more appealing to players who think they are interested in heavier rock music. The Les Paul vs Stratocaster debate has been going on for decades, but the good news is there is no wrong answer! The Electra amp is more than enough for a beginner, but will likely be the first piece of gear they eventually upgrade. Fortunately there are some awesome practice amps on the market today for around $100, so, if a new guitar player saves their pennies, in a year or so they can significantly upgrade this kit for not a lot of money. Trying to learn on a cheap guitar is frustrating, since they often aren’t made very well. Choosing a brand like Epiphone from the beginning means less aggravation, more enjoyment and, hopefully, more practice! The Epiphone starter pack is another great deal for newbies. It comes with a tuner, strap, gig bag, picks and access to downloadable guitar lessons. 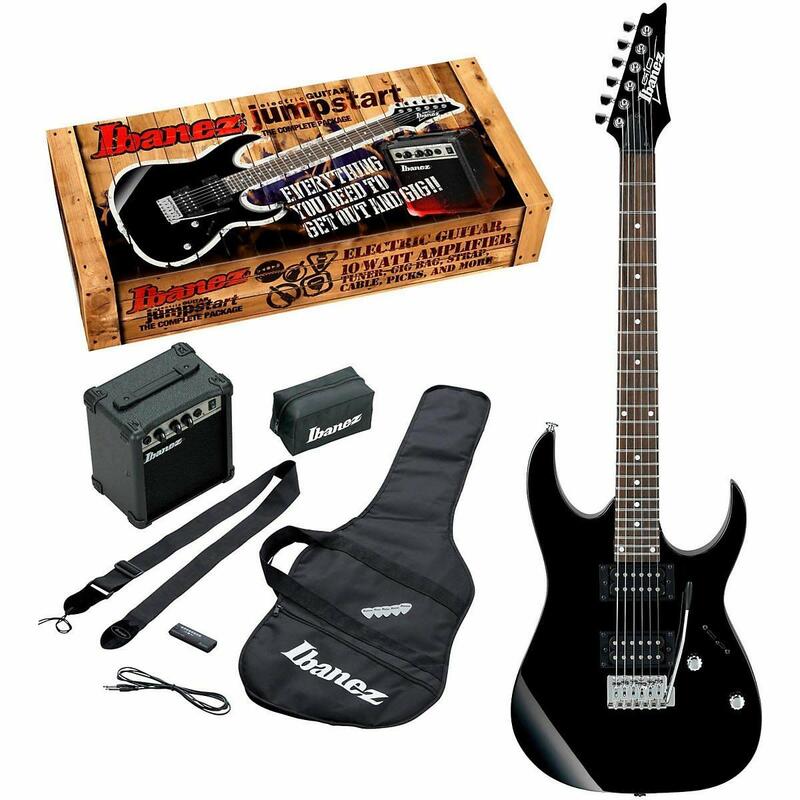 In addition to an awesome starter guitar, Ibanez gives you all the accessories you need to begin your playing career. Ibanez is a Japanese company that has been making high-quality guitars for decades. They are well-loved in the hard rock and metal communities, but also make some great models for jazz and other playing styles. Ibanez guitars are known for fast, flat necks. For experienced players this means smooth, precise playing, but for a newbie it could mean they’ll have an easier time fretting notes and getting around the fingerboard. Fretting-hand technique is one of the hardest things a new guitar player has to learn. It can by very physically demanding until the muscles in the hand become accustomed to the movements and positions. Any guitar that can make this process easier can help a newbie tremendously. Like the Epiphone starter pack, the guitar is the strongpoint in this kit, and it ought to serve a new player well for quite a while. The guitar is based on the legendary Ibanez RG series, which are among the top choices for hard rock and metal musicians. Like the big-brother RG, this newbie version has hot humbuckers and a slim neck. It’s a great choice for newbies who are into metal, but can serve well in just about any genre. Many inexperienced players will find the Ibanez neck easier to negotiate, and for this reason it’s a great choice as a first guitar. And like Epiphone and Squier, Ibanez is a quality name you can take to the bank. With a 10-watt amp, headphones, picks, strings and other accessories, there is more than enough here to get a new player started. Ibanez makes some decent amps, and very good effects pedals, but this little practice amp may be the first thing you look to upgrade. This is a quality starter pack from one of the best names in the business, and one of the top choices for a beginner. You may be tempted to grab some super-cheap, no-name guitar package you find in a big-box store or online. You may get lucky and end up with a decent guitar, but more than likely there is a reason the kit is so cheap. With the three options above you have the power of major guitar brands behind the products, and you can expect good things. Plus, if a new guitar player suddenly realizes they were meant to be a drummer instead, a guitar with a well-respected brand name on the headstock will have better resale value than some no-name guitar. All three come with great guitars, but the Epiphone may have a slight edge. All three come with solid amps, but the Fender is the best of the lot. 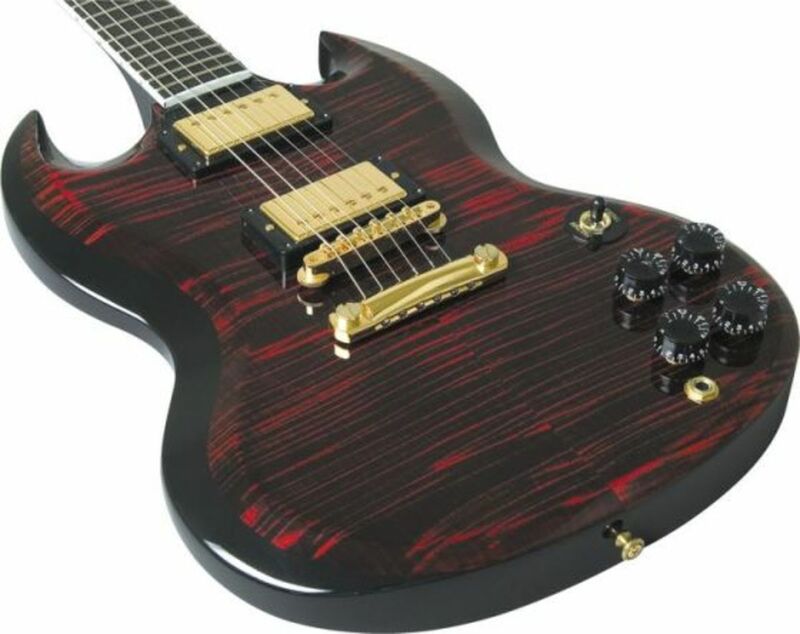 The Ibanez may be the better choice for players who want to play metal and hard rock. The Stratocaster may be a better choice for players who want to play blues or country. But, really, you can’t go wrong as a beginner with any of these three packages. A newbie guitarist will be off to a great start whether they choose Squier by Fender, Epiphone or Ibanez. Hopefully this article has been helpful. 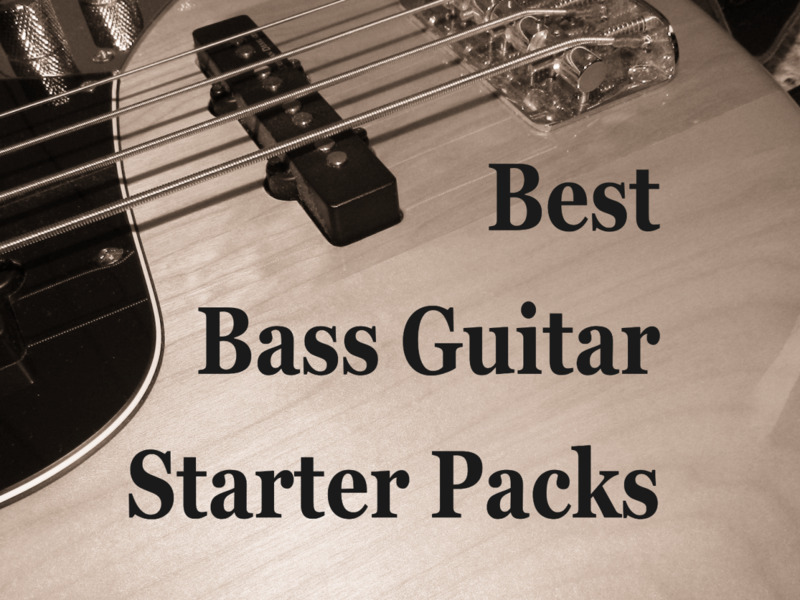 Good luck on your quest to find the best electric guitar starter pack for beginners. Which starter kit impresses you the most?